Painting allows Christian Romantic art to register the expression of an Absolute subjectivity as a reconcilement with its own finite subjectivity through the embodiment in a work of art. The way in which religious figures are depicted in Romantic art, is a process that has been constantly refined and expounded within the Christian paining itself. 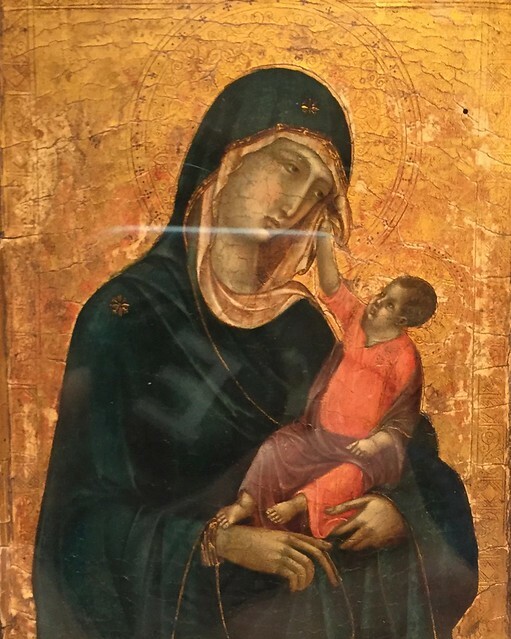 Here, through a few late-Romanesque paintings that can be encountered in The Metropolitan Museum of Art, it will be chronologically demonstrated how the inner subjectivity of Madonna and Child had been expounded, towards the end of expressing Absolute subjectivity of these depicted holy figures. This procedure in Christian painting and Romantic art as such, is generalized by Hegel as a style that worked out a way of expressing the soul and the inner life of a depicted holy figure. 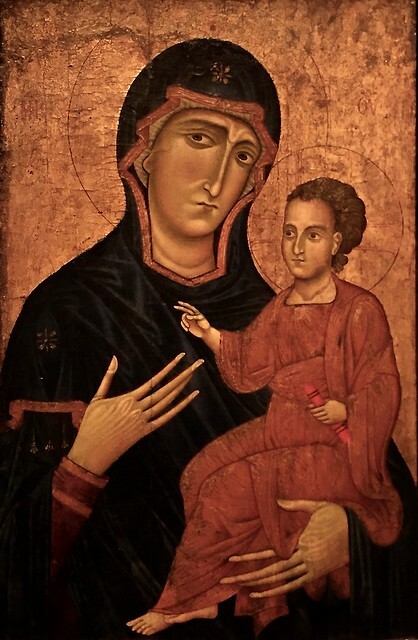 With early icons, it is evident how the Absolute figure of a divine mother and child consists of attempts to embody holy subjectivity in an anthropomorphic human figure, as observed in Berlinghiero Berlinghieri’s Madonna and child. Romantic art gains a higher ground due to painting being its primary medium; in contrast with Greek sculpture, which can be largely summarized in its inability to convey a figure’s “light of the eye”6—a feature that only painting can achieve since as it is capable of revealing the inner subjectivity of the aboslute spirit. The manner in which this inner subjectivity is conveyed by the use of gazes among depicted holy subjects, is a feature that evolves chronologically in the history of Romantic art as such. The development of eye gazes and facial expression in depicted human figures is one of the most important tasks that Christian painting sought to expound and develop over a span of several centuries. As this feature of gazes evolves, so does the face expression—a development that can be observed in Duccio’s Madonna and Child, painted 70 years after Berlinghieri’s Madonna and child. As Romantic art continued its detachment from heroic deeds, family obligations, and political life; it starts to depict other forms of activities as expressions of the Absolute Subjectivity, one of which, is breastfeeding. As observed in Virgin and Child by the Master of the Legend of Saint Catherine, the nursing Madonna is breastfeeding a figure Jesus resembling an infant rather than an adult, as it does in prior depictions of Jesus. The working out of the ideal of baby Jesus, from what was initially a figure of a man—is an example of the process of transcendence and detachment from all obligations contingent on human finitude—into a subject whose inner life is realized as a subject-matter. 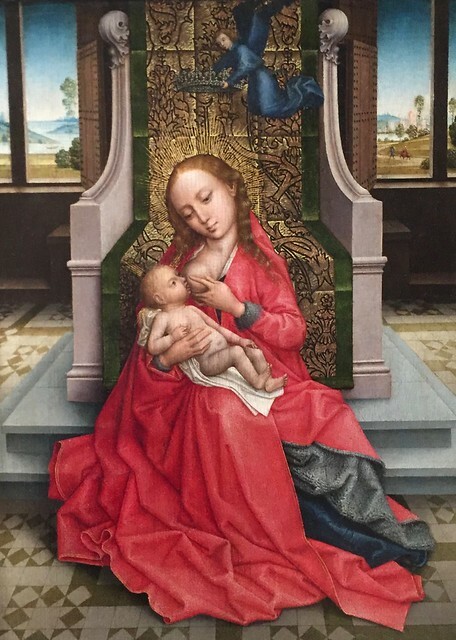 The depiction of breastfeeding is a representation of divine or maternal love, which Hegel refers to as “the most beautiful subject to which Christian art in general, and especially painting in its religious sphere, has risen”.7 In Virgin and Child, the act of breastfeeding goes beyond the reality of the “spirit’s bodily organism”8, which allow it to become an ideal representation of love in its inner life. This love is not conveyed in a manner that instructs the biological obligations that the spectator must partake in, nor a representation of an absorption of a person in another limited person; but rather, an Idea of love in its Universal, Transcendental, Absolute form.9 Divine and maternal love as subject-matter becomes successfully universalized in Romantic art, which brings the inner life of the beholder to its ideal—through the painting itself. The spectator’s gaze of an elaborated Romantic artwork, is no longer the most important end for the realization of an artwork’s spirit, instead, it becomes a mean for the realization of an artwork’s subject-matter for itself and in itself. The artwork therefore becomes embodied with inner subjectivity. The following may be somewhat speculative but neverthelss a derivative from Hegel’s thought. It appears that within Romantic Christian art, the viewer (or the spectator) is no longer the final nor the end of a realized painting. In Symbolic and Classical forms of art, a work can be fully realized once it becomes possessed by the viewer’s gaze. In Romantic art however, the viewer’s gaze is no longer a fundamental feature since the artwork is already worked out in its absolute form, and the addition of a viewer’s gaze is no longer necessary for the realization of the painting’s inner Absolute ideal. This therefore entails that the painting becomes something resembling an autonomous entity—which generally prefigures modernist art in general. It may therefore be unsurprising that Hegel’s exposition of artwork as a method of striving towards the achievement of Absolute Spirit—in parallel with a similar thought manifested in Hegel’s own philosophy as expounded in works like Phenomenology of Sprit—would end up with a secularization of art, rather than having art that serves the function of achieving the final, transcendent role for human finitude—the attainment of Absolute Spirit. Hegel, being a thinker who understood philosophically where the history of art leads, abstained from the naivety that we moderns must return to Christian painting. Since there is no way back to re-experiencing and re-living the subjectivity of Egyptian temples, Greeks sculpture and Christian paintings, we moderns, can only be anthropologic philistines at most, left with nothing but a grasp and understanding of these achievements in thought—as owls of Minerva who spreading their “wings only with the falling of the dusk”10. It is the trauma of precisely this lost cause that sought to transcend human finitude, that perhaps, ultimately is impossible to get back; while an attempt to nostalgically return and re-live this past project of humanity, only results in a mix between either Third Reich aesthetics or barbarous Al-Qaeda religiosity—and this is precisely the deeply melancohlic trauma of the modern subject. Instead of transcending human finitude, modernity brought a secular world filled with monads and entities—whether that is an artwork or a person. But the project of transcending human finitude and achieving the inner Absolute through the development of inner subjectivity—had been abandoned, for the better but for the worse.